Samsung has announced the production of high-density 8Gb GDDR5 memory chips, hinting heavily at a planned redesign for Sony's PlayStation 4 games console in the process. 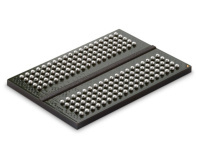 Memory chips are typically measured in the number of bits they store, while modules - comprised of a number of individual chips linked together - are measured in bytes. A 1GB DIMM may, for example, be made up of eight individual 1Gb DRAM chips. Increasing the density of each chip means that fewer chips are required to reach the desired capacity: by doubling the density of each chip to 2Gb, only four would be required on the DIMM to reach the same 1GB capacity. In mobile designs, this saves space; elsewhere, it drives down cost and reduces overall power draw. 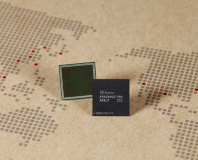 Samsung's latest GDDR5 VRAM chips, built on the company's 20nm process node, are claimed to be the first 8Gb density modules in mass production. While that spells great news for laptop makers who use the parts to support dedicated graphics modules on higher-end devices, the company is dropping some extremely heavy hints about one customer in particular: Sony. 'We expect that our 8Gb GDDR5 will provide original equipment manufacturers (OEMs) with the best graphics memory solution available for game consoles as well as general use notebook PCs,' claimed Joo Sun Choi, executive vice president of memory sales at Samsung's electronics arm. Note the reference to 'games consoles': currently, the only games console on the market to make use of GDDR5 memory is Sony's PlayStation 4, which packs 8GB of the high-bandwidth DRAM for shared use between the graphics and general-purpose processing portions of its AMD accelerated processing unit (APU) heart. 'Combining only eight of the new 8Gb chips will achieve the same density as the 8 gigabytes (GB) needed in the latest game consoles,' the company's press release clarifies - again, making direct reference to Sony's PS4 without actually naming names. The suggestion is clear: Sony could drop the number of chips required to build its latest console, should it choose to use Samsung's latest parts. A redesign for the console is certainly not impossible: its last-generation PlayStation 3 launched in Europe in March 2007 and was supplanted by the PS3 Slim just two years later. The PS4, meanwhile, was released in November 2013 - meaning a Christmas 2015 'PS4 Slim' release isn't out of the question, based on the company's track record. A more likely outcome, however, would be a board-spin which uses the new chips but leaves the exterior of the console alone - saving Sony the cost of a complete redesign while giving it the power and price benefits of reduced component count. Sony has, naturally, not commented on Samsung's heavy hints.